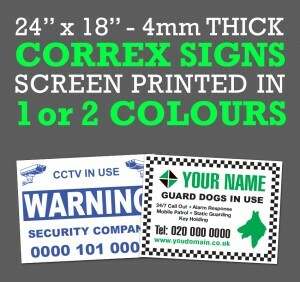 Our correx signs can be screen printed or for full colour designs, digitally printed onto white a currugated plastic. The correx material is lightweight and waterproof and ideal for exterior or interior use. 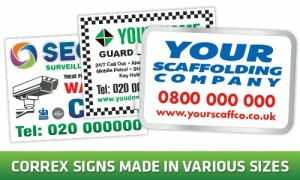 Security Boards, Estate agents boards, ConstructionSite Boards, Safety Signs and Scaffolding Frame sign inserts. These are just some of the uses of this material. 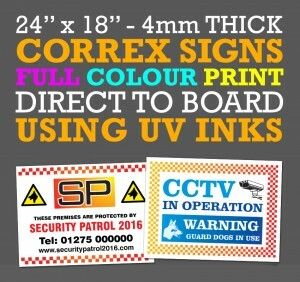 Correx security signs are printed on 4mm thick plastic, though metal frame scaffolding sign inserts are printed double sided on a 6mm thick plastic which makes it easier to install into the metal frame signs.